Whew! We're only a few weeks into summer and I'm pooped! I finally got a little bit of free time this week to work on my cards. 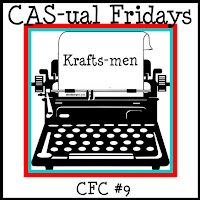 Today I'm playing with the CAS-ual Fridays Krafts-men challenge CFC#9. 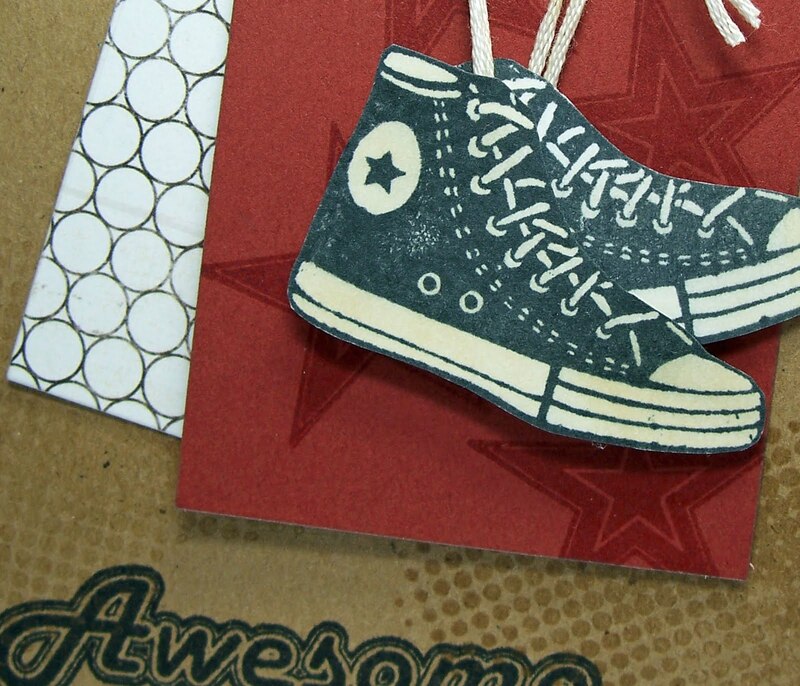 The challenge is to make a masculine card that incorporates kraft paper. 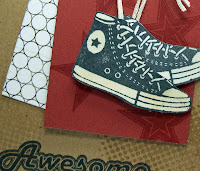 I started off with a kraft base that I stamped with this great grungy-tire track kind of pattern from WPlus9 stamps. Versamark on kraft is one of my favorites. The sentiment is also from the same stamp set (great set especially when you have twin 12 year old boys). The main image is a stamp that I got from a seller on etsy (sugarskull7). I stamped 2 sneakers and fussy cut them both. I inked them a bit with Antique Linen distress and added some embroidery thread "laces" to hang them from. Underneath are two notebook pages cut with a PTI die. The top page is a deep red that is Versamark stamped with a star background (also from the same WPlus9 set, goes great with the star on the sneaker). The back page is a great Basic Grey pp. This card was so much fun to make because the imperfect stamping only adds to the fun. Thanks for looking! How fun! Love those sneakers and all the fun pattern you've stamped into the background. Versamark on kraft= genius!! So glad you played along at CAS-ual Fridays! This is such a clever idea! I love the laces for the sneakers. Perfect card for a teenage boy. I really liked every element of this card. I thought hanging the sneaker with the clip was genius and the notebook pages from patterned paper and stamped with the star was such a great choice. 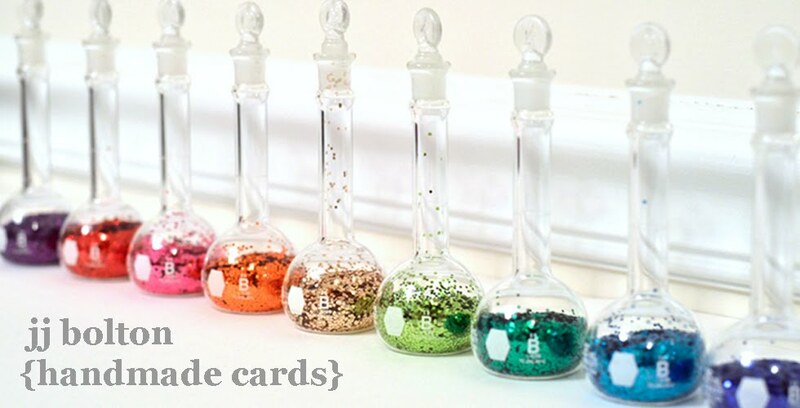 I am going to have to try that idea, never used two on a card before! Too cute and so creative. Classic and Clean. 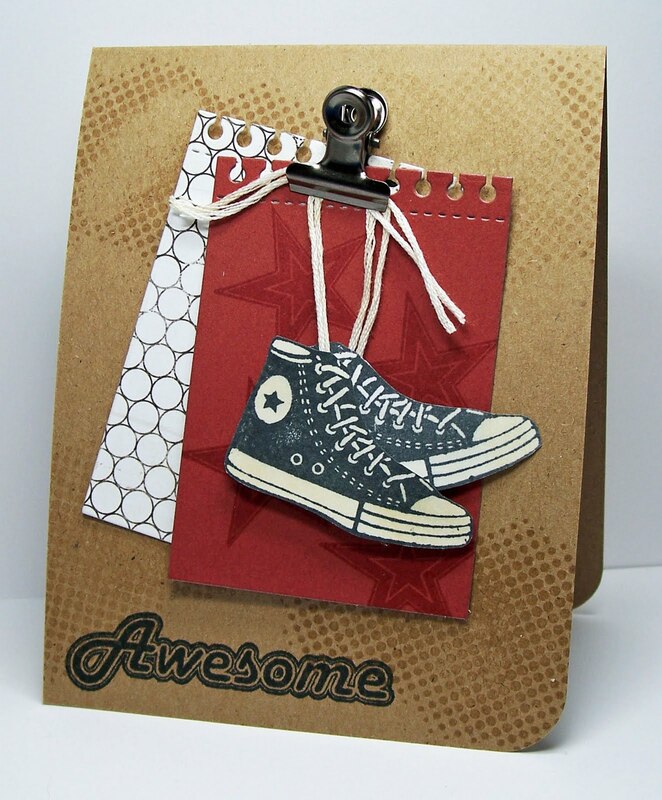 So classic using old school converse and love how they hang. Too cool. Great dude card. I just love this - what a great guy card. Those sneakers are awesome ;) and I love the way you added the laces & have them hanging up. My only thing, as mom of 11 & 12 yo boys...they'd never be hanging up without nagging first, right? lol I love the grungy background too, and the perfect colour combo! This one is outstanding! Love this design! Thanks so much for playing with us at CAS-ual Fridays!